Leiserowitz, A., Maibach, E., Roser-Renouf, C., Rosenthal, S., & Cutler, M. Climate change in the American mind: May 2017. The Yale-GMU report, published yesterday, is based on a survey of 1,266 adults from May 18 to June 6 of this year, and the results have an average margin of error of 3 percentage points. 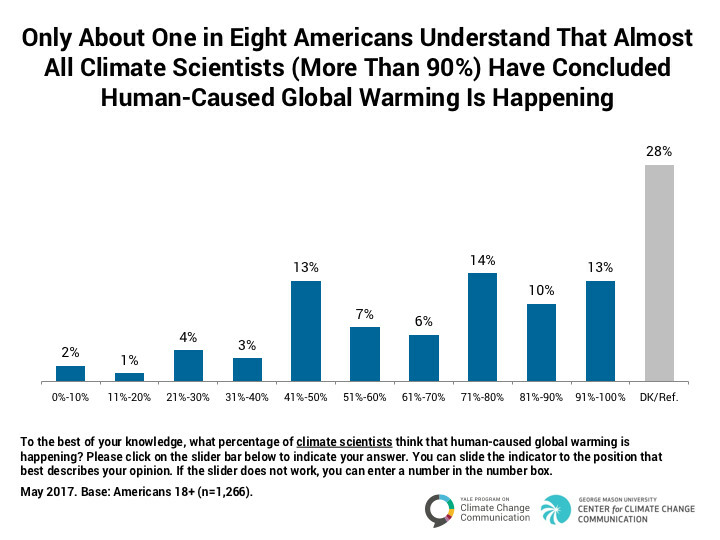 Why is perception of scientific consensus so important? Turns out that it’s actually a “gateway belief” to support for public action on climate change, according to a study from 2015 cited in the report. In other words, the more one perceives there to be a scientific consensus on the reality of human-caused climate change, the more likely they are to believe that it is real and worrisome. And the more one believes that human-caused climate change is real and worrisome, the more likely one is to support public action on the issue. Meanwhile, the Trump administration does seem to intend to “perpetuate the myth that there is no scientific consensus,” his co-author, Edward Maibach at George Mason. Maibach and Leiserowitz point to another finding that offers a little more hope: 58 percent of Americans, the highest percentage since the surveys began in 2008, believe that climate change is mostly human-caused. Though that still means four in 10 Americans don’t. So how do we continue to build understanding of the scientific consensus on climate change under an administration sowing ignorance and doubt? As Michelle Nijhuis wrote for Vox, it “may be possible to metaphorically ‘inoculate’ people against misinformation about climate change, and by doing so give the facts a boost.” That’s worth a try. We’re also going to have to confront the massive “crisis of authority” and crisis of our scientific institutions under the Trump administration if we want to fix the messy politics of climate change in the US over the long term. Prev Being rich wrecks your soul. We used to know that.